As you all know, I like simple. And that includes cooking. I don’t like elaborate recipes, and if I see a list of ingredients that is long or has too many unique ingredients, I dismiss it. That is why I LOVE this super simple fudge recipe. I have been making it for years and it makes a great homemade gift at Christmas. I must admit, when people ask for the recipe, it is one of those embarrassing answers, “Oh, it’s like 3 ingredients and no time at all!” Ha! But that’s ok, I’m not trying to impress anyone, just enjoy the result and the time together! Well, last night my daughter and I made the usual fudge recipe, with a twist! Over the years, I have added toppings to this recipe such as Heath crunch or crushed oreos. Sometimes I even make it with other flavored chips- white chocolate, peanut butter, etc. This time I had an idea! pretzels! Now, I have been gluten-free for 11 weeks, and there are many things I miss. So this recipe just gave me such excitement because I could eat it! Crush pretzels in a ziplock bag and set aside. Melt over low heat on stove- chocolate chips, milk, salt, and vanilla. Stir constantly until all melted and no lumps. Remove from heat. Pour into wax paper lined pan. Top with crushed pretzels, and push them down with a spoon so they set with the fudge. Refrigerate 30-60 min. Cut into squares and enjoy! 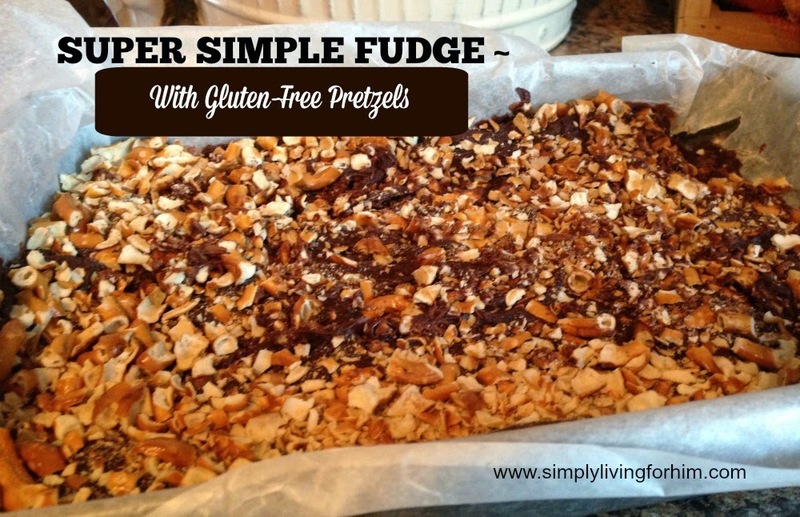 Super simple, gluten free, and delicious!